The chargesheet in the Samjautha Express blasts case, which was filed recently by the National Investigative Agency, states that two crucial players in the case are still absconding. 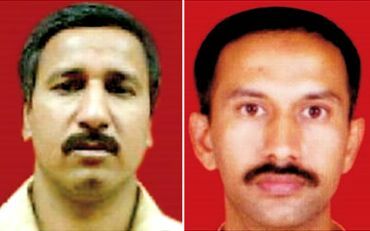 Ramji Kalsangra and Sandeep Dange are two very crucial players, not only in this case but also in the cases pertaining to Mecca Masjid blast in Hyderabad and Ajmer blasts. The NIA does realise the importance of nabbing these men and says that finality to this entire terror cycle can be attained only when these two are in custody. The NIA is hot on the trail of these two men, but the more important question is: where are these men hiding? Some intelligence inputs go on to suggest that the moment the heat was on, they managed to slip into Nepal. This is not the first time that a person from this module has taken shelter in Nepal. Praveen Muthalik, an accused in the Malegaon blasts, too has taken the same route. He was however nabbed when he made a visit to India a couple of months back. The Nepal corridor has been often discussed and this used to be a primary route for Pakistani spy agency Inter Services Intelligence-sponsored terror groups. However, there is now a clear turf war on in this country between the two modules -- one from India and the other from Pakistan. According to sources in the Intelligence Bureau, most of the Pakistan-based terror modules have now shifted operations to Bangladesh since they find that to be a safer haven. When some fringe elements within the Abhinav Bharath planned to carry out terror attacks, one of the aspects that was discussed was relating to the hideouts. Every terror group needs to find a safe haven once the attack is carried out. These elements had discussed the possibility of Nepal being a hideout once operations were completed. The main issue at that time, however, was that the Lashkar-e-Tayiba and the Dawood gang were using this base extensively and they did not want any clash with them. Over the years, they started to set up modules within Nepal and also created a safe route to slip out once an attack was carried out. This group however did not exercise this option for quite sometime since all the attacks that were being carried out by them were being attributed to Muslim terrorist groups. However, when the investigations took a different turn, some of the key men involved in the attacks began moving into Nepal. For this group, the Himalayan country was the best option since it is a familiar terrain for them. The language, the culture was similar and hence they found it easier to gel with the locals there and remain undercover. Once these modules in Nepal were activated there were changes in the Lashkar modules. There was a clash between the two modules and this prompted the Lashkar to close down several of its modules in Nepal and shift into Bangladesh. The Lashkar, too, found Bangladesh to be a better option when compared to Nepal since their operatives were finding it more comfortable to be there once again due to the similarities in cultures. Investigations into the Samjautha, Ajmer and Mecca Masjid blasts show that there are still a few terror modules within India. These modules thrived on the moral support of some people. Moreover it was also learnt that they did want to keep their operations a secret and hence did not involve too many people. Right from the planning stages, to the logistics and then the execution, the operations were known only to a handful of people. The plan was to build up more modules within India over a period of time while they had decided to use all the modules created in Nepal as hideouts. The NIA, is, however doing a proper check on the whereabouts of the two absconding men and are even ready to bring them down from Nepal. There are no major issues on the diplomatic front to bring down criminals from that country. However, they would want to be 100 per cent sure before they can make a final move. The NIA realises that the probe will hit a road block if these two men are not nabbed hence they are being very careful. Has Mecca Masjid blast probe met another dead end?